The 2015 Nissan JUKE operates on a 1.6 liter Direct Injection Gasoline DOHC 16-valve turbocharged 4-cylinder engine generating 188 hp and 177 lb-ft torque. The Nissan JUKE’s efficient engine lets it achieve great gas mileage! The 2015 JUKE achieves approximately 32 mpg highway and 28 mpg city*. 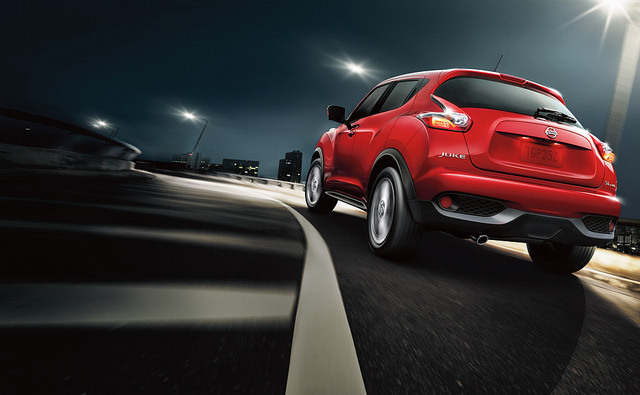 Everyone knows the JUKE’s quirky styling and it has only become more and more popular over time. Some of our favorite standard exterior features on the 2015 Nissan JUKE are the 17-inch 5-split spoke aluminum-alloy wheels, the projector halogen low beam headlights with automatic off feature, the LED signature accent lights, and the dual power outside mirrors. On higher trims, you can find more incredible features including: a power sliding glass moonroof with one-touch open/close and tilt feature, heated side mirrors, rear privacy glass, fog lights, or exceptional features found on the Nissan JUKE NISMO® models. 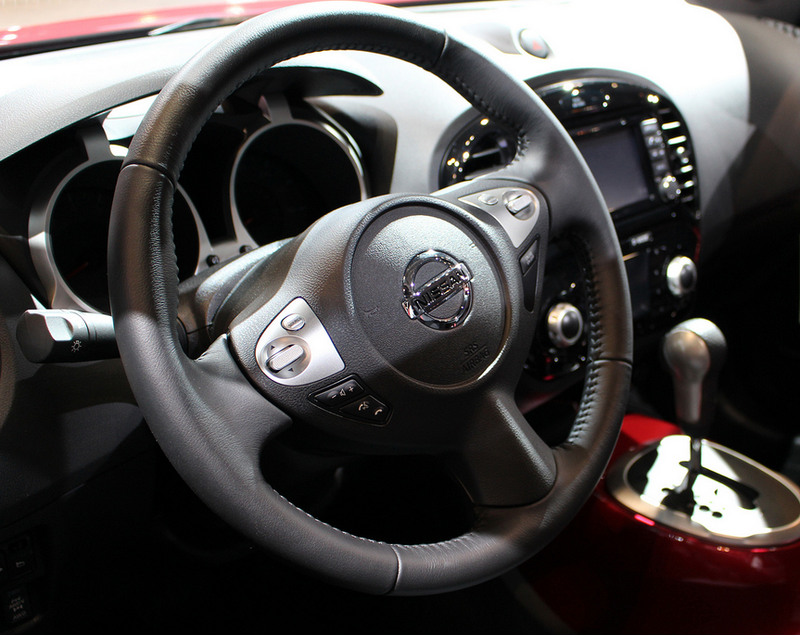 The exterior of the 2015 Nissan JUKE may have an exciting exterior, but the interior is strictly for comfort! Some standard interior features include: NissanConnect? with Mobile Apps, hands-free text messaging assistant, Bluetooth® hands-free phone system, rearview monitor, drive computer with outside temperature display, air conditioning, cruise control with illuminated steering wheel-mounted controls, Nissan Intelligent Key® with push button ignition, cloth seats, AM/FM/CD audio system with 5” color monitor, SiriusXM® Satellite Radio with 3-month trial subscription, streaming audio via Bluetooth® wireless technology, 6 speakers, USB connection port for iPod® interface and other compatible devices, auxiliary audio input jack, MP3/WMA CD playback compatibility, speed-sensitive volume control, and iIlluminated steering wheel-mounted audio controls. Want more? Some higher trim level features include: NissanConnect? with Navigation and Mobile Apps including 5.8” color touch-screen monitor and voice recognition for audio and navigation, SiriusXM® Traffic and Travel Link® with 3-month trial subscription, Around View® Monitor with Moving Object Detection (MOD), leather-appointed seats, heated front seats, leather-wrapped steering wheel and shift knob and a Rockford Fosgate® ecoPUNCH™ audio system with 8” subwoofer, amplifier, and 6 upgraded speakers. There is a Nissan JUKE for everyone, no matter what you are looking for! The 2015 Nissan JUKE was built to keep you safe. The premium standard safety features include: Nissan Advanced Air Bag System with dual-stage supplemental front air bags with seat-belt and occupant-classification sensors, Driver and front-passenger seat-mounted side-impact supplemental air bags, Roof-mounted curtain side-impact supplemental air bags for front- and rear-seat outboard occupant head protection, Vehicle Dynamic Control (VDC) with Traction Control System (TCS), LATCH System (Lower Anchors and Tethers for Children, and Tire Pressure Monitoring System (TPMS) display. Be sure to stop into Carriage Nissan and take the 2015 Nissan JUKE for a test drive today! With our large inventory, our team here at Carriage Nissan loves helping our customers find the perfect new car or used car for them! Please feel free to contact us if you have any questions or would like to schedule a test drive!